Madigan made… a simple gathered fleece scarf. Today is Day Three of Simple Scarf Week! Are you loving all of this warm and cozy neck-hugging goodness? I am! Did you miss my cowl scarves from old sweaters or the infinity scarf from a t-shirt? Well, after two days of (practically) no-sew scarf ideas, I thought I’d show you a very simple scarf that anyone can sew. No, really, if you can sew a straight line, I promise that you can make this scarf. Make a scarf out of fleece! Fleece is great material and if you cut it evenly, you don’t need to worry about finishing the edges. Sure, you could make a simple scarf by just cutting out a strip of fleece fabric and calling it a day. But when I added these rows of big pleats to my fabric, I think it transformed the fleece to a cozy and custom looking scarf. I love the texture that the rows of pleats created! Want to make one, too? Just follow these steps! 1. 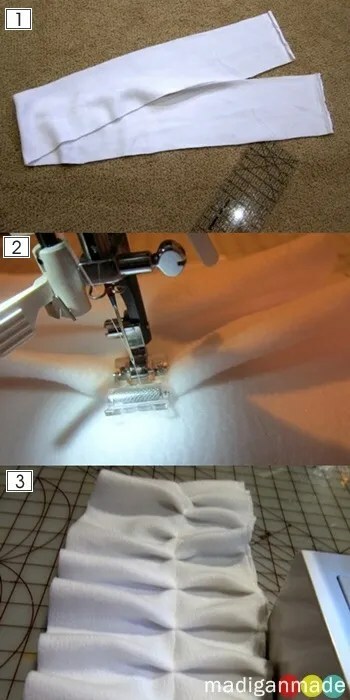 Cut your fleece to a desired length. Keep in mind that the scarf length will shorten up after you pleat it. My piece was about: 62” x 7” Part of me wished I made it a wee bit longer. 2. Work from the middle and run a straight stitch down the center of the scarf. Fold a piece of fabric under every inch or two as you sew. Back stitch both ends of each line to secure the thread. 3. Repeat step 2 by running more stitches down both the edges of the scarf and try to follow the pleats you made from the center line. Then, run stitches down in between those lines. I had a total of 5 lines of stitching. Don’t worry if the pleats don’t match up exactly or if your stitches aren’t straight… it is all about creating texture! I’m loving this white scarf! With the pleats, it is so full now and it feels like a fluffy white cloud around my neck. I think it looks great against a dark jacket. Check back here tomorrow! That scarf used even more great fleece in a fun print and I finally figured out how to make a reversible cowl scarf.